I am not much of a warmonger … We’d all live in peace if I had my way, however, I am sure this was a marvelous war toy in its day. 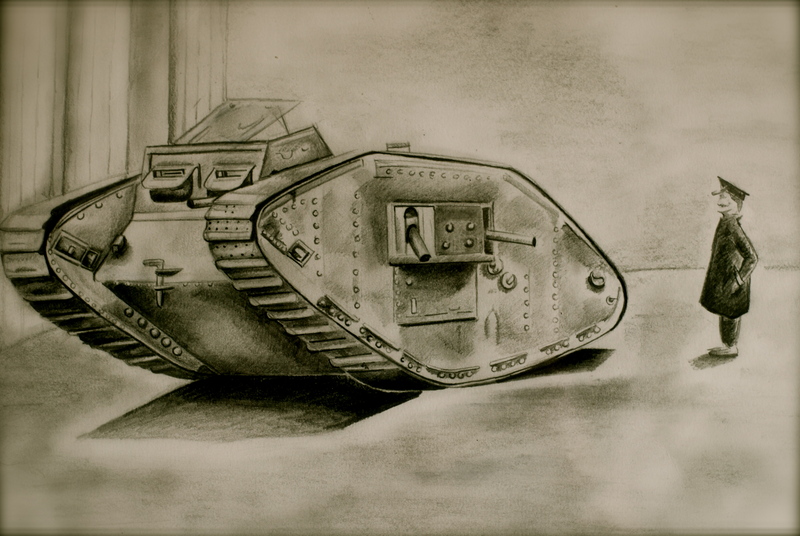 It is a nice drawing, despite my opinion of war. The first suicide bomber? 😉 . I shouldn’t jest about war, but that was my first thought when you enlightened me on the tank’s shortcomings. I think I’ve become calloused and sarcastic on the subject. I really do like your drawing though. Pictures speak 1000 words and give us insight into history, be it good, or bad. Hi Rachel, may we use your sketch in a school project about WW1? It would be included in a DVD and web site to help tell a story of trench warfare. We can credit you if you want with your full name. Can’t pay fees though, sorry! Thanks Rachael. We will give you a credit and link and I will send you a link to the web site when it is live. It will be ready sometime in May or June.